Nicky and Nana Take A Road Trip! As the More is More Mom®, I must say that water in the basement certainly creates…..more opportunities. My mom is amazing. She is everything a mother and grandmother should be; loving, encouraging, supportive, humorous, engaging, nurturing, involved, and devoted. My people are her only grandchildren and they swear that “NANA” stands for Nick-Amanda-Nick-Amanda. Even Wrigley makes out like a bandit. He never has to check in to a doggie motel, because he gets to be a city dog and vacation with his Nana and Boppa in Chicago. We’re lucky he’s willing to come home with us. Our cul-de-sac is sooooo boring; it’s nothing like Wisteria Lane. This was the plan: Sunday night my mom would zip out to the ‘burbs in her Zoom Zoom Car (her Mazda 5, which she is crazy for!) and chauffer Amanda around town for a few days while I took Nick to his golf tourney in Wisconsin. Chuck of course would have to go to work (it’s a four letter word for a reason). Wrigley was super pumped to have time with his Nana. He likes her best because she holds his rawhide for him while he gnaws at it and she takes him for lengthy, leisurely walks. When the floodgates opened up to our basement, I called my mom and asked if she would mind taking Nick to his tournament instead. Mind? Absolutely not! She’d be delighted. Time with a busy teenager can be rather elusive and she’d been missing her Nicky Boy. Sometimes she will come for a quick sleepover to get her Nick fix, even if it’s just to look at him do his homework (though they usually stay up extra late and have a Will Ferrell marathon. Apparently napping is never frowned upon during 1st period.). Now that I am a semi-professional golf spectator, I gave her the lowdown. Sunday night they would play a practice round and ride in the golf cart. Then, the following two days she could walk the 36 holes and admire Nick (in the nearly unbearable sun and heat). She was thrilled! We are a city people, accustomed to the concrete jungle, so three days on the links sounded like a vacation. 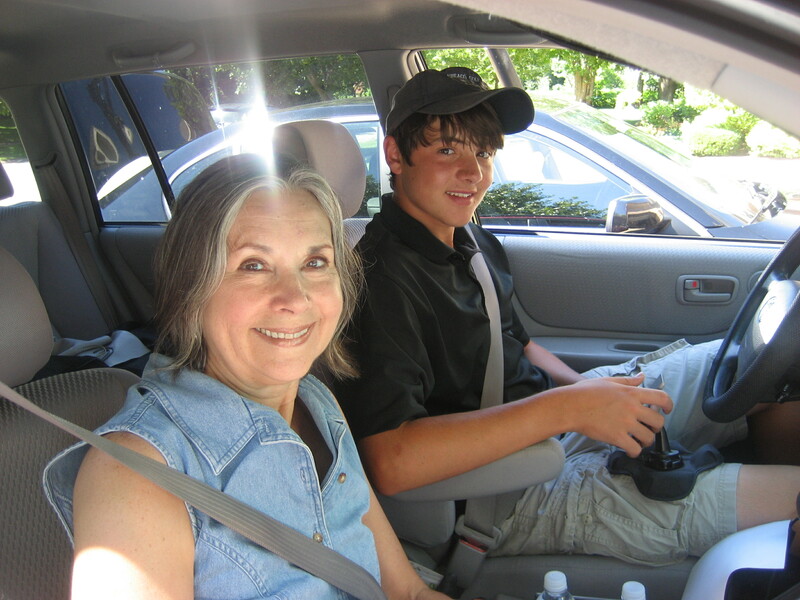 Nana loved her time with Nick in the golf cart, cruising around from hole to hole. She is a woman that loves a good souvenir t-shirt and was hopeful the tournament would be selling one to commemorate her time with Nick. Apparently, I’ve not given my mom enough credit; she is actually very good at locating the ball and keeping score….of everyone playing in the round. I can never find the ball and after each t-shot turn to Nick and ask, “Where did it go?” As we move on to the next hole I inquire, “How many strokes was that?” Not irritating at all. They found a hotel that they both liked, while I complain about everything. If we don’t move to another hotel, at the very least, we change rooms. Each night they ate at one of Nick’s favorite establishments, Buffalo Wild Wings. One night they spent 4 ½ hours at the Cineplex enjoying Inception and Salt. As it turned out, Nana brought Nick good luck. He shot a 78 the first day and a 74 the second. She was down with the lingo and would text us things like, “37 on the front 9 with a double bogey.” I barely know what that means! The best part about our basement flooding (other than the overdue spring cleaning) was that Nick got to spend a few quality days with his Nana. What could be more meaningful than that? More Cocktails and Appetizers on the Wild Side! As the More is More Mom®, I’m always up for more fun with family and friends. 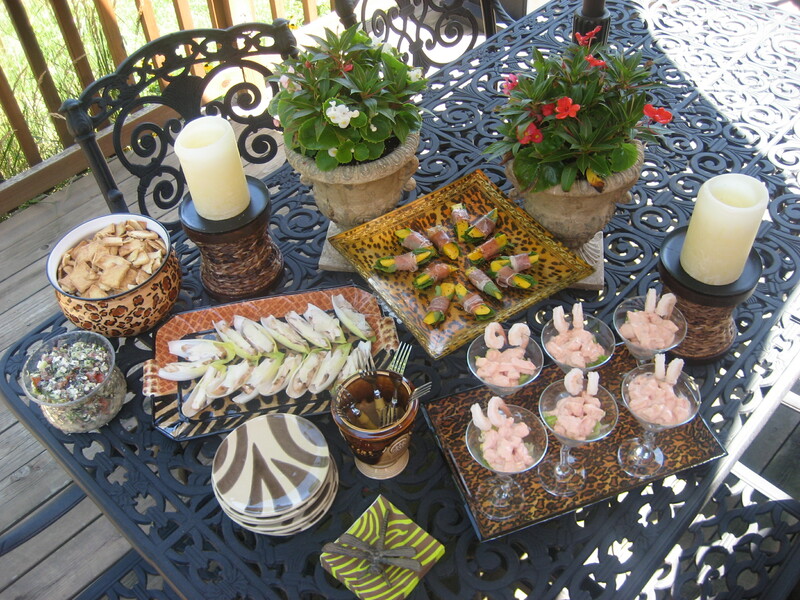 We’ve barely scratched the surface of our Safari Cocktail and Appetizer Party. You may recall that the stage is all set to greet our guests with a cool and refreshing beverage (detailed 7/28/10). 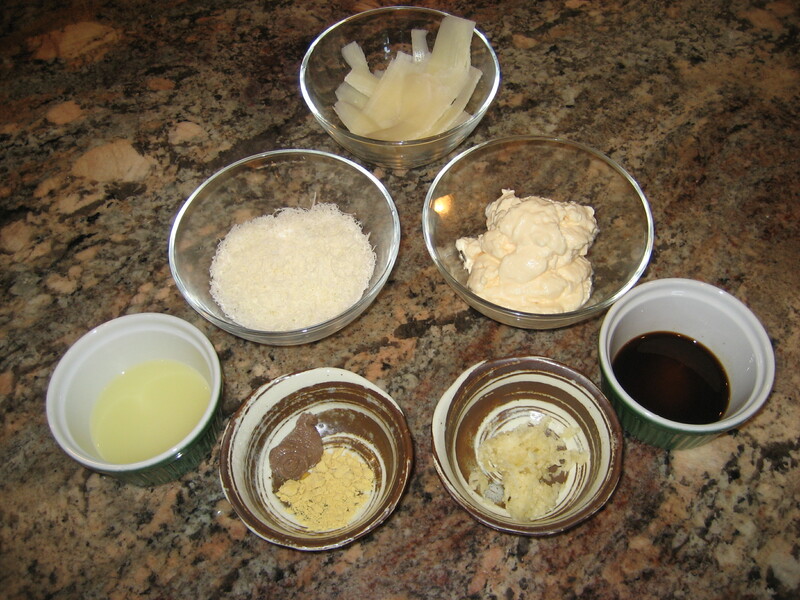 The beauty of all the recipes that I am sharing with you today is that they are largely prepared in advance, leaving a little bit of assembly just before your first guest arrives. Nothing says over the top indulgence better than Shrimp Cocktail (except maybe caviar, but who really wants to eat all of those little fish eggs anyway?) served in an elegant martini glass. Now that’s instant glamour. 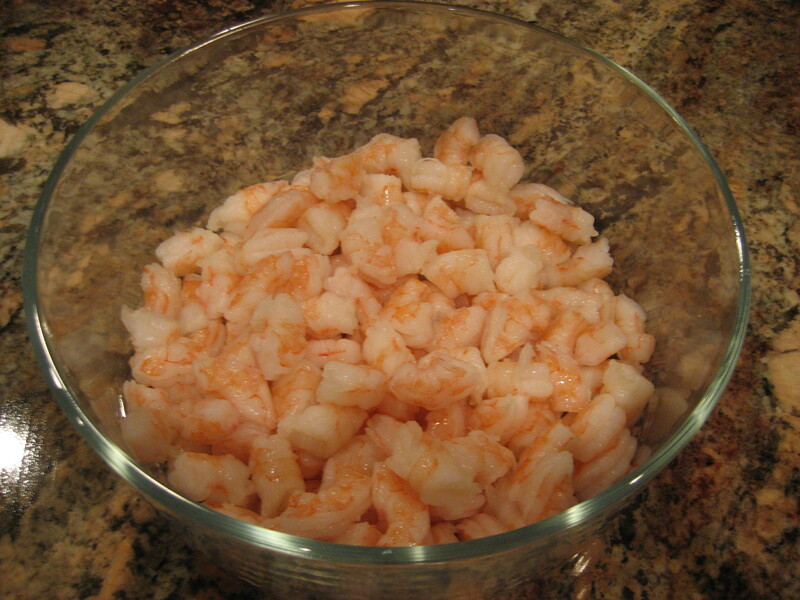 ½ – 1 lb cooked peeled Jumbo shrimp. We’re going to artfully arrange a few tails over the rim of the glass for each guest. Beautiful! Note: For the sake of simplicity and my sanity, I defrost my shrimp the evening before I am going to serve it. I store them in a Ziploc Baggie, lined with a paper towel (I prefer Bounty, the quicker picker upper. This is not a paid advertisement, darn it. I just so happen to be fan!). Rarely do I serve shrimp cocktail individually. 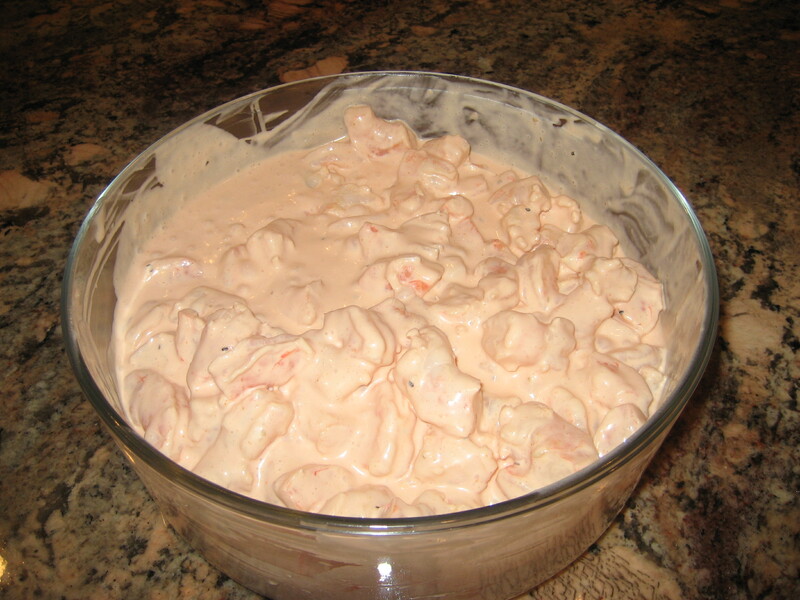 As a rule I serve it in a silver platter that I toss in the freezer before the party to help the shrimpies stay nice and cold, but not soggy as they tend to get when directly served on ice. 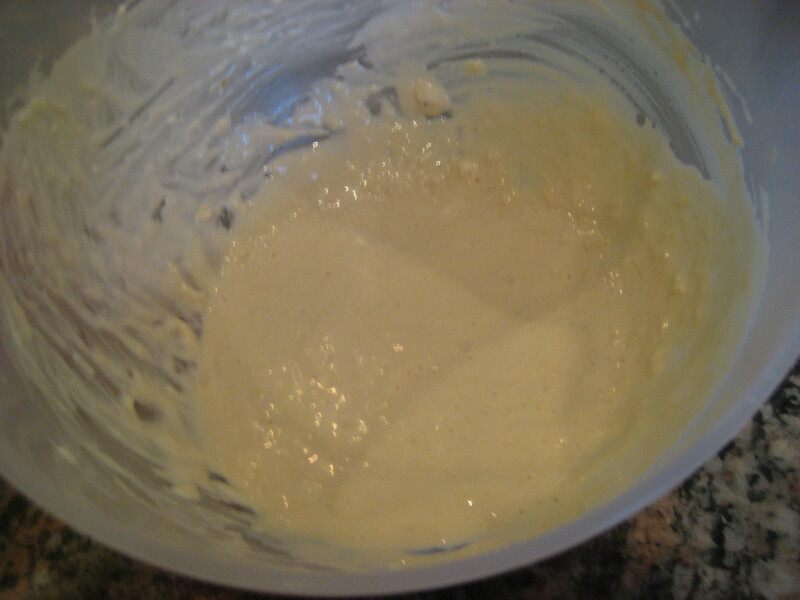 Add more lemon juice as needed to make the sauce super tangy. Stir in the chopped shrimp. 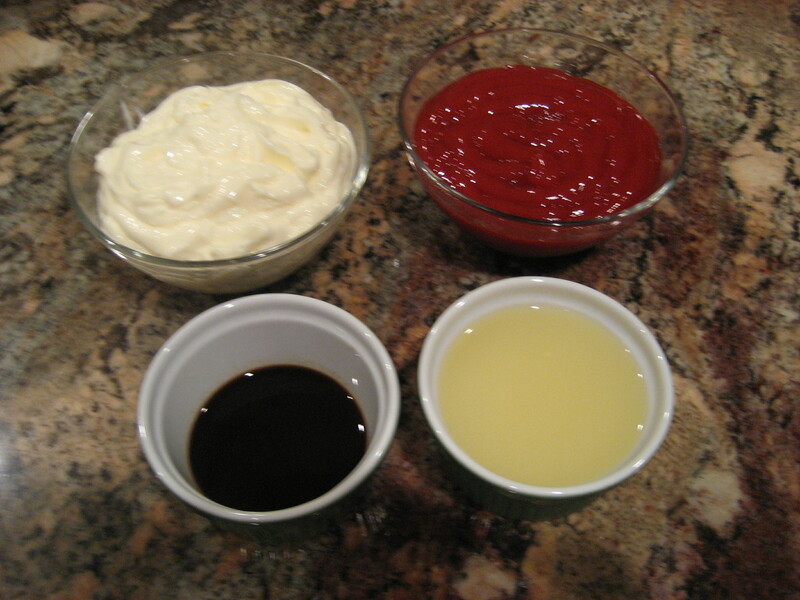 Transfer to a container with a lid if you are leaving it in the refrigerator over night. Fill each glass about 1/3 of the way with the lettuce. 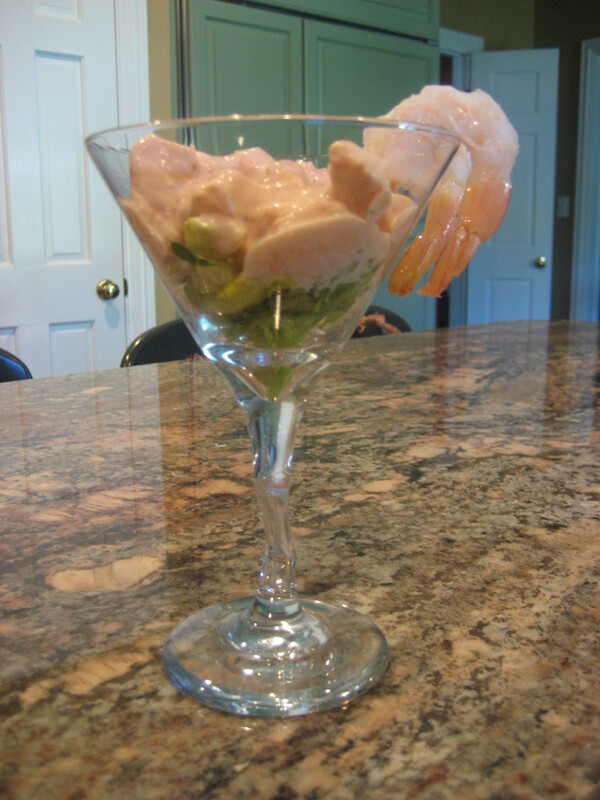 Spoon the shrimp mixture over the lettuce, evenly amongst the 6 glasses. Drape a few jumbo shrimp over the side of each martini glass. For maximum impact, I placed all 6 martini glasses on a leopard tray. I order a grilled chicken Caesar salad at nearly every establishment I patronize, so I’m kind of an expert. The individual spears were a party in your mouth! 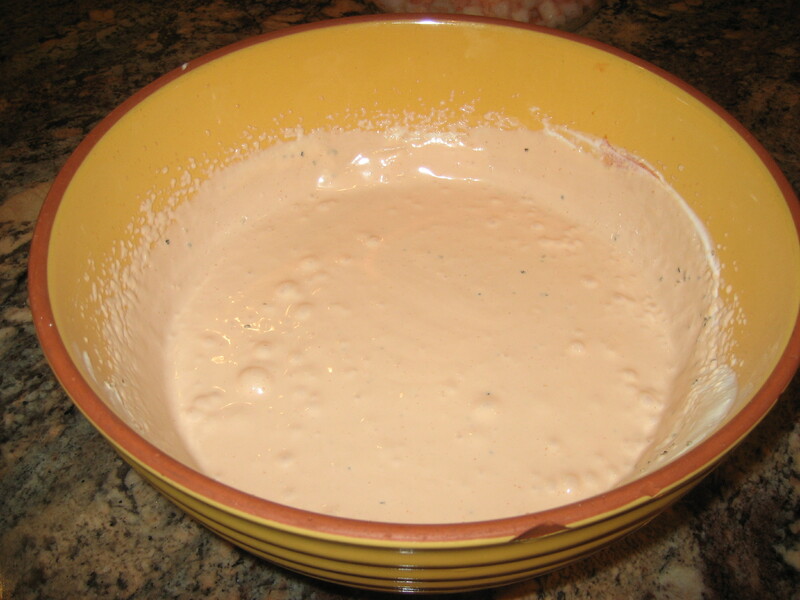 I tossed myself a little salad with the left over dressing a few days later and I’m telling you, there’s not a Caesar salad out there that rivaled it….. This recipe makes approximately 20 spears. 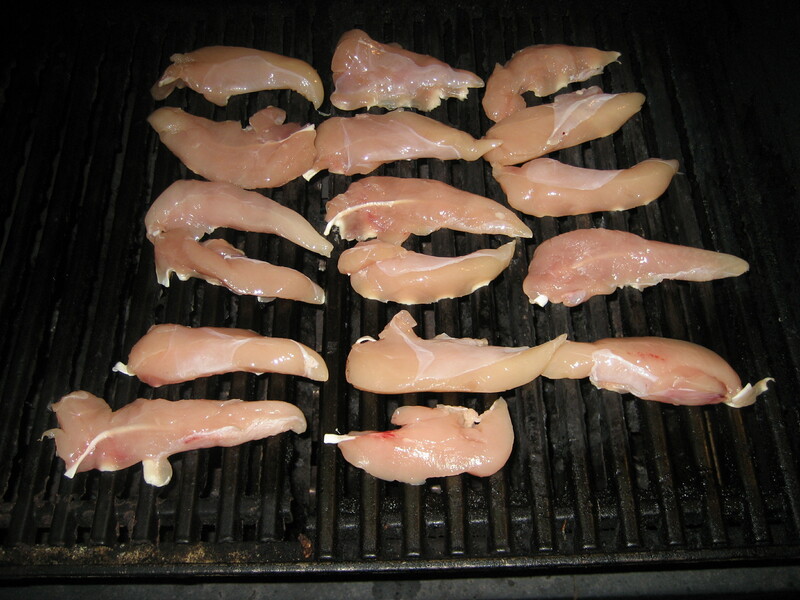 Once the chicken cooled, I sliced each strip in half making it a more manageable serving size. As is my M.O., I placed the chicken in a Ziploc Baggie lined with a Bounty paper towel and stored in the refrigerator until ready to use. 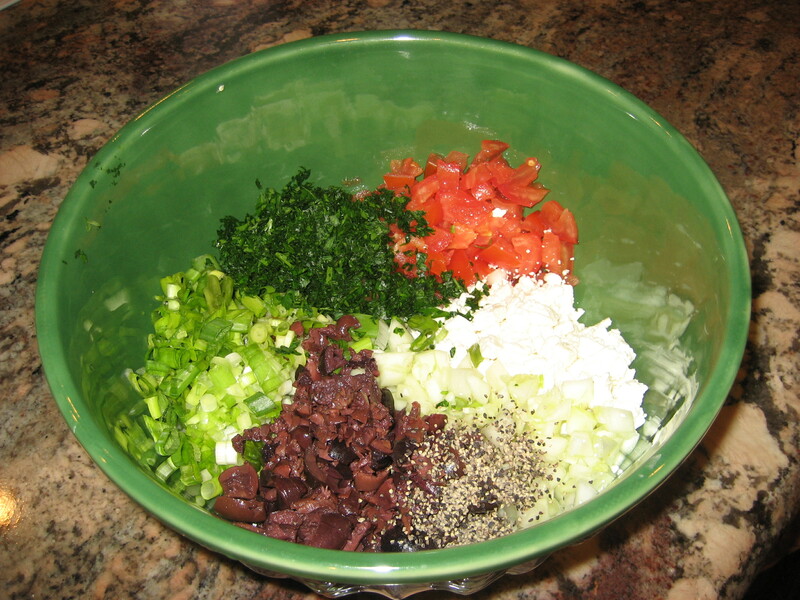 Mix well and store in a bowl with a lid overnight. 2-3 heads of small romaine lettuce leaves. 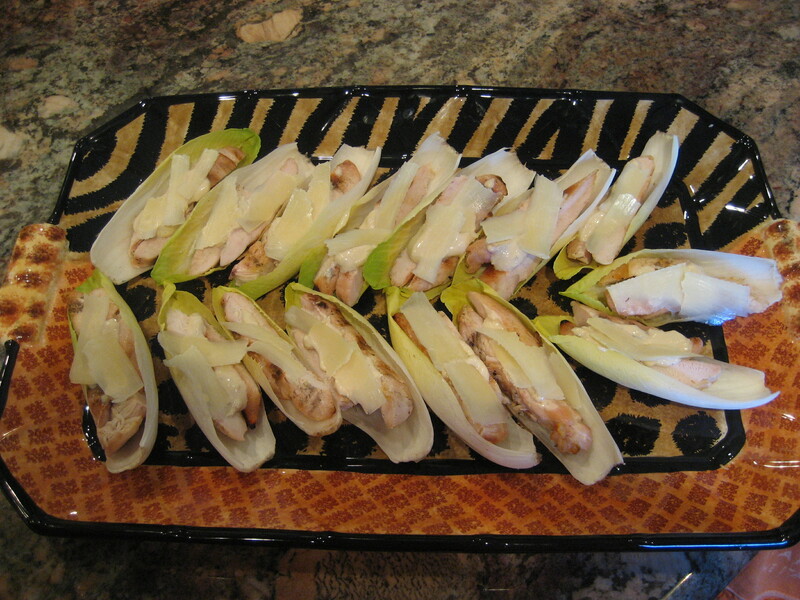 I used endive instead because it was the perfect size. If it floats your boat, top with capers. Artfully arrange the spears on a platter and serve to the “oohs and ahs” of your guests. 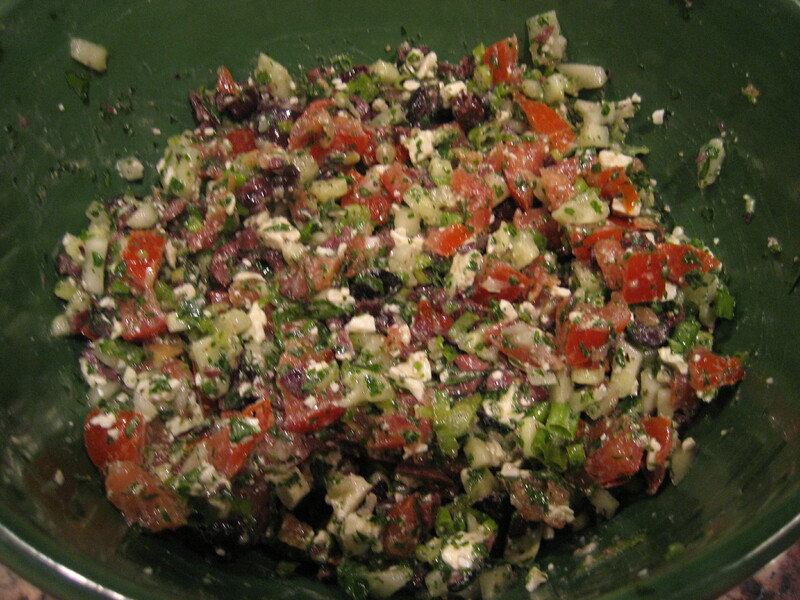 The Mediterranean flavors are a welcome respite from your more traditional salsa. 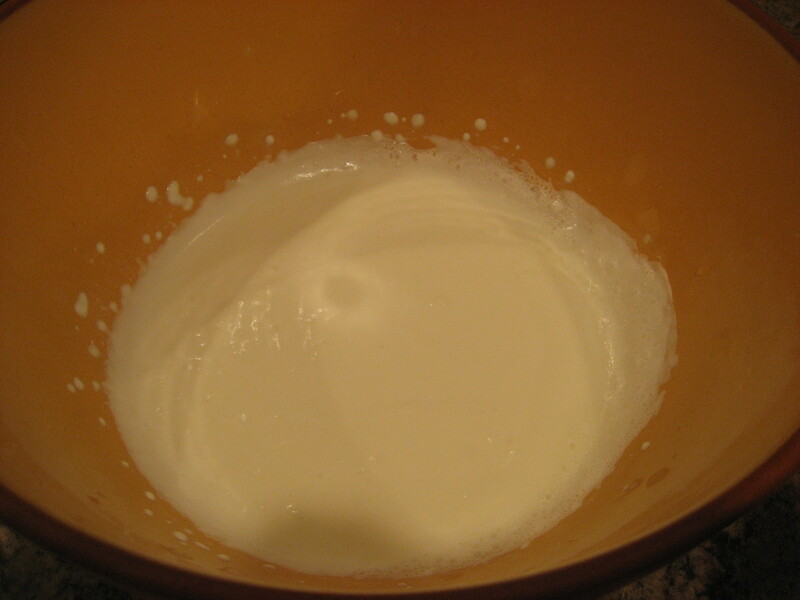 Cover and refrigerate for at least a few hours, but overnight is even better. When you are ready to serve, transfer to a pretty bowl. I chose a lovely cut crystal to equal the formality of the martini glasses. Serve with pita chips. I like Stacy’s in the jumbo bag from Costco, though you could certainly toast your own. Instead of tossing the chips in a predictable bowl, I served them in a cheetah patterned planter (that I only use for food service). I like the shape and whimsy of the planter. Should you have any salsa left over, you might enjoy it spooned over a grilled chicken or fish on another night. I hope you have as much fun with this menu as we did. What could be better than more time with friends on a beautiful summer night with more delectable dishes, more laughs, more good times and more memories? Cocktails and Appetizers on the Wild Side! 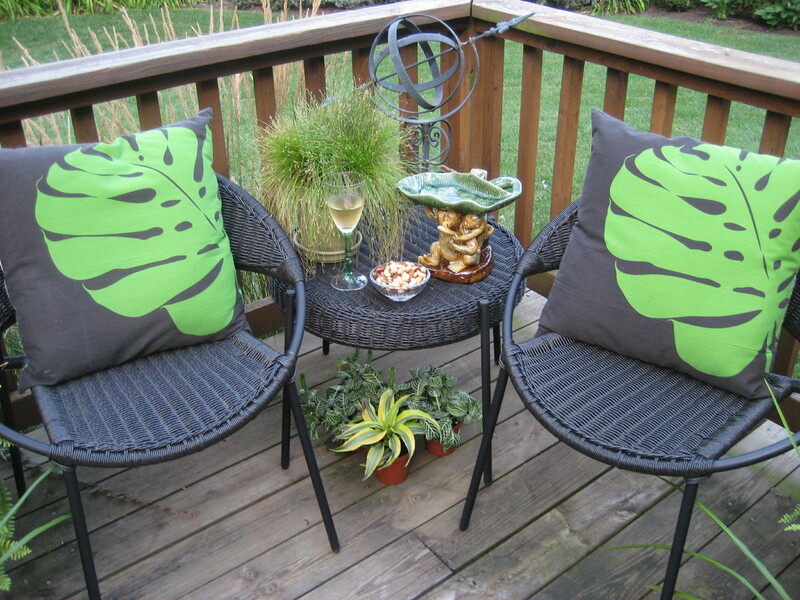 What could be a better way to celebrate summer than with cocktails and appetizers on your patio, deck, porch or balcony? Come with me, the More is More Mom®, as we take a walk on the wild side…. Always and forever, the very best parties start with a cohesive theme. Celebrating the holidays is a total gimme because the theme is readily defined; the food and décor fairly expected. Throwing a soiree just for fun however offers an opportunity that is completely open to interpretation. Inspiration is everywhere. It can be as simple as food from a favorite region or country or a combination of colors for your menu or décor. My best advice is that you immerse yourself in your theme to make it as authentic as possible. The extreme summer heat was perfectly relevant to a Safari inspired party. I set up my bar at my cocktail table on my deck. 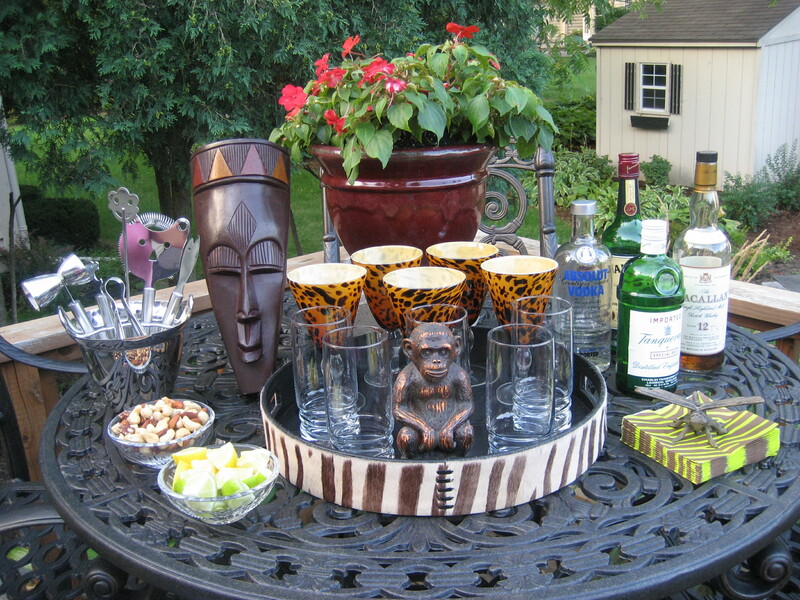 In a round, zebra skin tray I placed tortoise wine goblets, highball glasses and a monkey statue in the center to kick off my theme. Behind the glassware, to add height and gentle softness, I placed a large pot of impatiens. 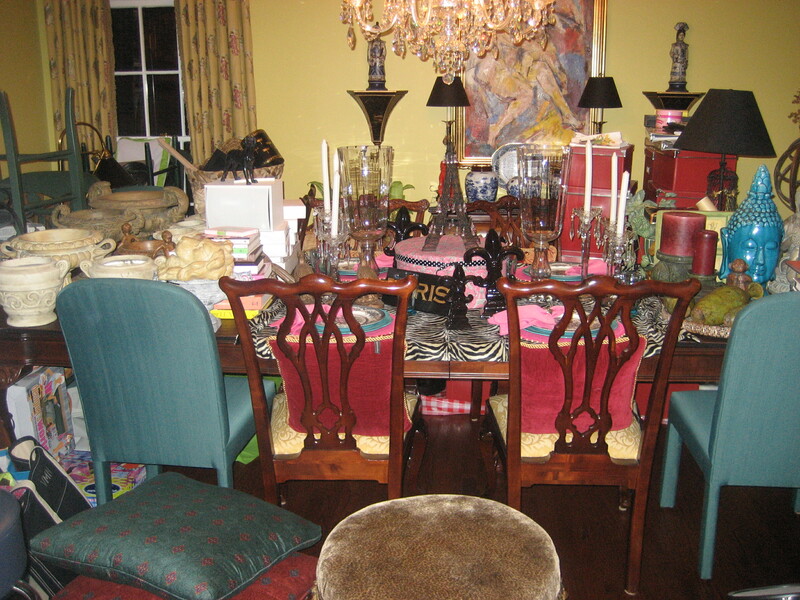 To the right, I offered a variety of spirits and placed chartreuse and brown zebra print beverage napkins. Be inventive. I borrowed a brown metal dragonfly that sits in my Powder Room as a decorative weight to keep the napkins from flying away. To the left I showcased a tall African mask, various cocktail making implements and two crystals bowls, one with mixed nuts for snacking and the other with wedges of lemons and limes. 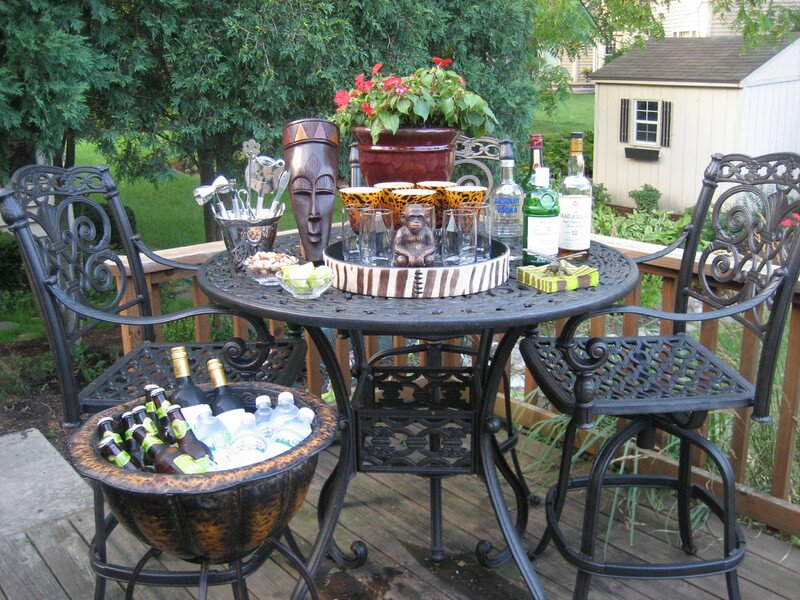 On the ground, next to my cocktail table, I filled a tall footed, metal plant stand with ice and nestled bottles of white wine, beer, soda and water to round out my beverage offerings. 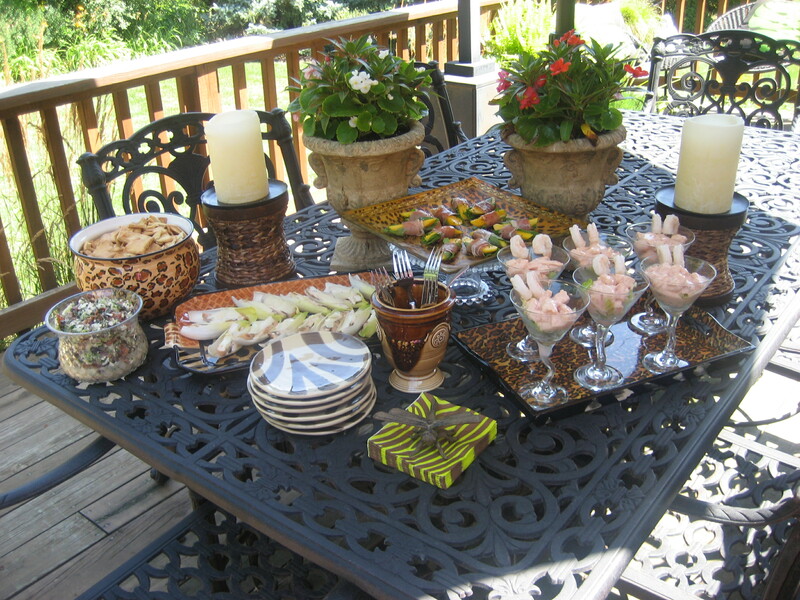 I set up my hors d’oeuvres buffet on my dining table outdoors. Setting up a pleasing arrangement is really quite simple; it should be bountiful and beautiful. I select platters and trays that compliment each other and my theme. I consider the number of serving pieces needed and how best to configure them for optimal reach. As a general rule, I like to use pedestals of varying height to create a display that is both user friendly and attractive. 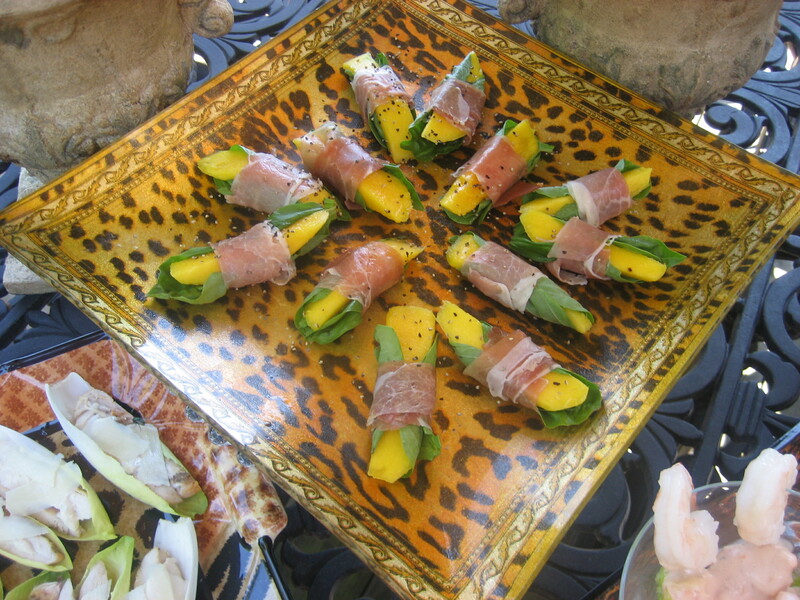 In the center of the arrangement I anchored a pedestal on which I placed a glass cheetah patterned platter, which just screams Giorgio Armani, for the Prosciutto Wrapped Mango Slices. 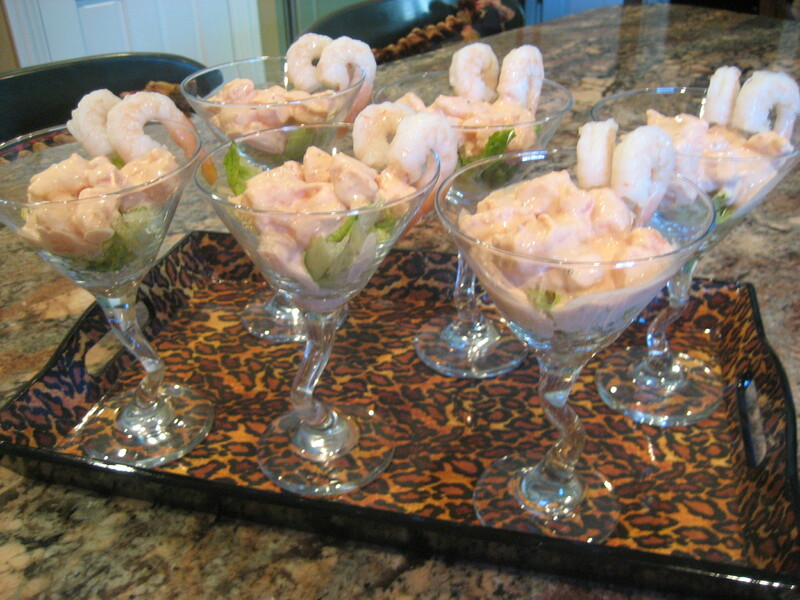 On an angle to the right, I used a leopard print tray to carry the martini glasses filled with the Shrimp Cocktail. 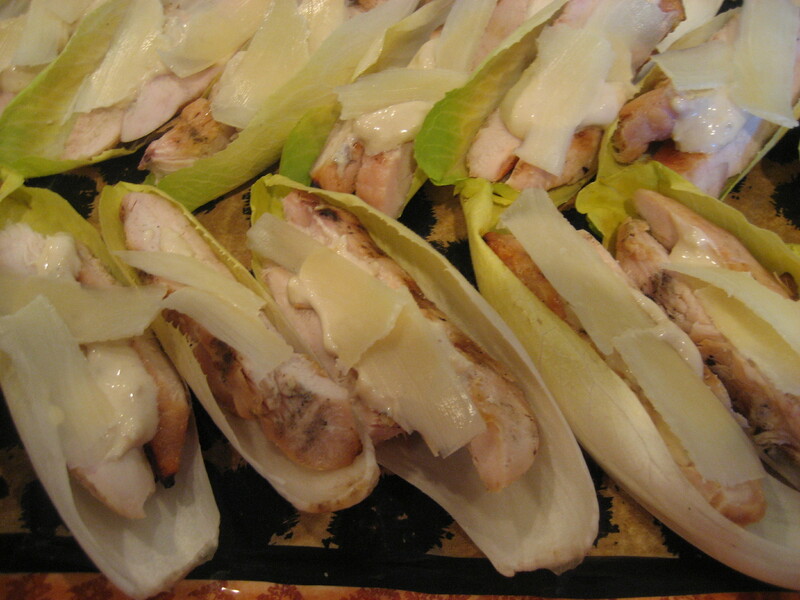 To the left I filled an animal skin patterned platter with the Grilled Chicken Caesar Salad Spears. 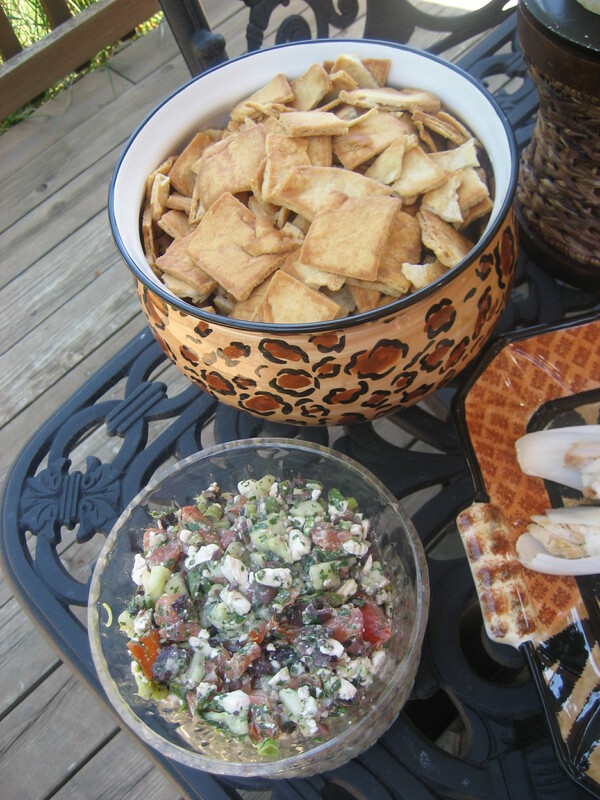 On the outskirts of the tablescape, you will find a cheetah planter filled with Pita Chips and a crystal bowl filled with the Greek Salsa. The rest of the buffet is filled in with potted flowers, pillar candles atop banana leaf holders, brown and cream zebra plates, more of the fun napkins from the bar and an urn holding utensils. The various heights and textures create a harmonious, gorgeous and generous feast. 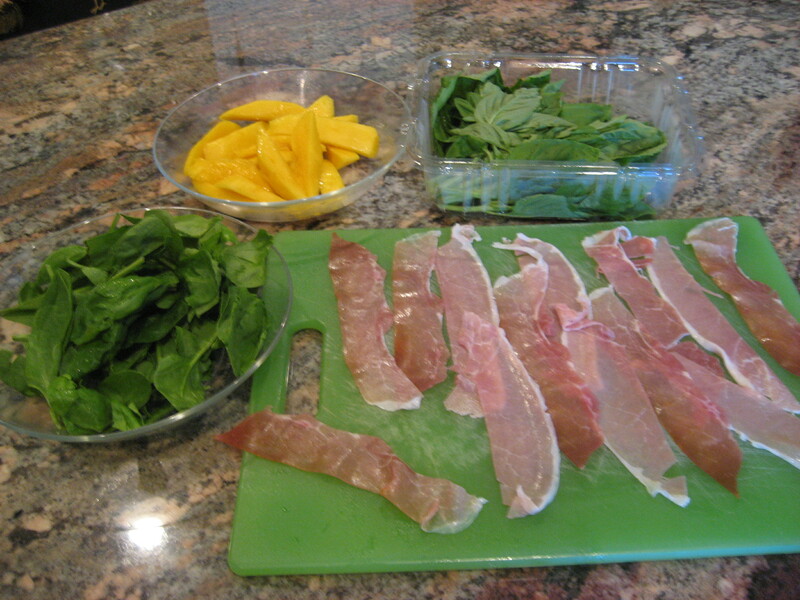 The Prosciutto Wrapped Mango Slices couldn’t be easier and more delicious! Your guests will be delighted with the sweet and salty freshness! As the More is More Mom®, you know how I am all about…..appreciating the beauty of my surroundings. In my Interior Design business, I have the honor of helping my clients create an experience that is personal to their family and tells the story of their lives. One of the questions that I am most often asked is, “How do I decorate my bookshelves?” Well, the very best place to start is with books! I am a paperback book snob. While there is always a time and a place for our most beloved paperbacks, gracing our bookshelves is not it. The formality of a proper book shelf screams gorgeous hardcover. Now, if the bookshelf in question is in a Library, Office or Den, then it is perfectly acceptable, expected almost, for the books to stack vertically on each shelf, from the floor to the ceiling. On the other hand, if your shelves are in a position to provide a little flirtatious function, then there are so many ways for them to be interesting and fun. The most important factor to consider when selecting which books will adorn your shelves should be that the subject matter is of interest to you. This photograph is of a piece that lives in my Family Room. It is a perfect blend of books that interest me, revealing a personal side of myself, and mementos that celebrate my family and our interests. The books I have chosen to share here are some of my very favorite subjects; Hollywood Glamour (live for it), Biographies (hope to learn from it), Manners and Etiquette (want to emulate it), Interior Design (immerse myself in it). Notice that in order to create a pleasing arrangement, there needs to be an organizing principle. I sort my books by subject matter and size so the groupings make sense. Here I have four rows of shelves, with three columns. The very top row of shelves are glass and I have lighting that shines downward. I have selected to allow the light to peek through the glass which is why I don’t have a sold mass of books on those shelves. For the sake of symmetry and balance, the third row of shelves from the bottom and the bottom shelves are treated similarly; the two outer columns display books that are arranged vertically, while the center column shows books that are stacked horizontally. They are arranged with the largest books on the bottom and the smaller books on top, again for a sense of balance. The second row of shelves from the bottom creates the opposite effect with the two outer columns featuring books that are stacked horizontally. Now that we have selected our books and settled on an arrangement, it is time to intersperse our family’s personality onto the shelves. Sharing the shelves with my books are some of my beloved photographs; my Nicky on the evening he lost his first tooth and was putting it under his pillow, my Amanda the same evening when she insisted she also have her photograph taken, me with my girlfriends, Nick and Amanda together, Amanda with our Wrigley, Chuck and me at our wedding and my mom and me when I was just a tot. Tucked amongst the pictures are my beloved, porcelain Tiffany Boxes, a bronze sleeping bunny (I’m crazy for bunnies), a camel from a family trip to Arizona which represents the Camelback Mountains, a brown dog in honor of our brown dog, statuary of a pixie fairy and a beehive because I love bees (and bugs and butterflies). The very top shelves share a common theme; each displays one of a series of a study of leaves (I love the idea of nature). 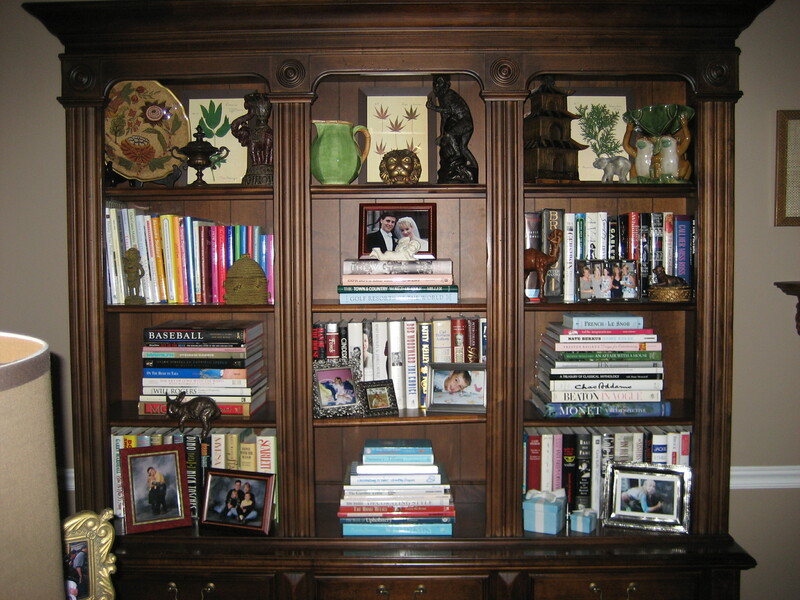 One shelf is home to a decorative plate, an urn and an elephant (trunks up for good luck). The center shelf displays a pitcher with a bamboo handle (a renewable resource), a lions head and a monkey statue that is charming and tall enough to balance out the height of the pitcher. The last shelf showcases a pagoda (in honor of my adoration of Chinoisserie), a froggy pedestal dish because frogs are cute and a Lalique, glass elephant which is just an amazing piece of artwork. The most important design rule to remember is that the more you love it, the more it will feel like home….. Rain, Rain Go Away….Flood My Basement Another Day! As the More is More Mom®, you know that I love more of everything……but more rain? Not so much. During the daylight hours, Friday was the perfect day, warm and sunny. By early evening, our car was all packed up with chairs, snacks and bug repellant. The one and only Huey Lewis and the News were playing at the Morton Arboretum (which may not be The Heart of Rock n’ Roll, but it’s still pretty good). I know that the weather people had cautioned us with the threat of rain, but how often are they actually right? I mean, isn’t the Doppler Weather Tracker System really more of a guideline? Who knew its findings were carved in stone? Certainly not me; though I suppose I was entirely optimistic because I was super psyched to hear Huey (cute as he is, he’s still no Donny Osmond….Patron Saint of Teen Idols). And then the monsoon arrived, completely uninvited. Well, when life gives you lemons, you just have to make lemonade. We diverted the caravan and instead went to a friend’s home with our picnic. They played their Best of Huey Lewis and the News CD. We had cocktails, dinner, some dancing and lots of laughs. It was a perfect evening….. I will tell you however, when we stopped laughing; the minute the continual rain flooded our street and our sump pump gave out. Ugh! Fortunately, Chuck is a More Handy kind of husband and he tends to pay attention to just this sort of nonsense. At 7:30 AM, as Chuck raced out the door for Home Depot, he instructed me to watch the hole and if the water got too high, he told me I should start to bail. Double ugh! Naturally, the water was on the rise and my son Nick and I got to bailing. We had a four bucket system going. I filled up the buckets and he emptied them out. This is why we have sons, to do the heavy lifting. It seemed like Chuck was gone forever, because he was. Our Home Depot was flooded. Our Ace Hardware was flooded. Menards was not flooded, but sold out of sump pumps. Finally, he arrived at his favorite, well kept secret Ace Hardware and they had sump pumps. Who knew how excited we would be to find plumbing supplies? As much as we bailed, water had begun creeping out of our storage room and into the finished part of our basement. Slowly it made its way around the perimeter when Chuck got the new sump pump installed. Yay! He stopped the water, but what a mess. Triple ugh! Why is it so much fun to collect things, but so tiresome to clean them up? Fortunately, because of my compulsive and organized nature, everything in the storage room is kept in Rubbermaid containers (I should own stock), so we didn’t lose anything. The real hassle was in clearing everything out of our finished area so we could lift up the wall to wall carpet and remove the wet padding. Where did it all come from? The urns and knick knacks? The boxes and boxes of cloth napkins and books? The busts and statuary? The decorative pillows and artwork? Oh, don’t let me fool you. I know exactly where every last item came from and we can start with TJ Maxx & More, Target and Tuesday Morning; the triple threat. With the carpet propped up on folding chairs and tables, fans blowing to keep the air circulating, the sea of tan carpet looks like the Indiana Dunes. Minus the fun, sand and sun.